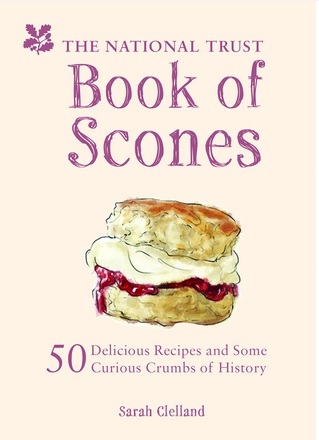 I occasionally have moments of doubt about this National Trust Scone Odyssey and whether I will ever finish it. I have started watching YouTube videos of Sally Gunnell talking about how WINNERS must VISUALISE themselves achieving their goals. And I picture myself entering a tea room for the final scone, surrounded by cheering well-wishers, to the theme tune from Rocky while someone shouts "LET'S. EAT. SCONES." into a microphone. But then the National Trust ruins it all by taking on another property. They keep doing it. 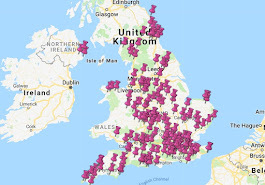 They had around 550 places on their books when I started and around 220 of them had tearooms. Every time they buy another bit of coast or a dovecote I shout "NO! STOP IT, NATIONAL TRUST! I HAVEN'T DONE THE OTHER ONES YET!" but they don't listen. They just keep on rescuing the nation's heritage with no thought for me at all. 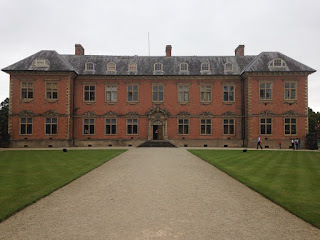 Tredegar House near Newport is a fairly new arrival - it was only taken on by the Trust in 2012 - and so I wasn't sure what to expect. Would the volunteers just shrug and say "I dunno" if you asked them a question? Would there still be a few die-hard squatters barricaded into the Drawing Room, refusing to come out until they were rehoused by the council? And that was the end of the Morgans at Tredegar. The house became a school, until the council bought the estate in 1974. The National Trust took on the lease in 2012 and have begun the process of restoring the place, starting with a £5m roof replacement project (eek). What a shame Evan spent all those millions on upside down crucifixes and baboon food. One of the volunteer guides pointed out the grave of Sir Briggs in the garden, marked by an obelisk. I should point out here that Sir Briggs wasn't actually a Morgan - in fact, he wasn't actually a human. He was a horse who survived the Charge of the Light Brigade with Godfrey. When the horse eventually died in his 20s, they buried him here. I've seen a few National Trust stables in my time, but Tredegar is the first one to keep a Dalek in theirs. 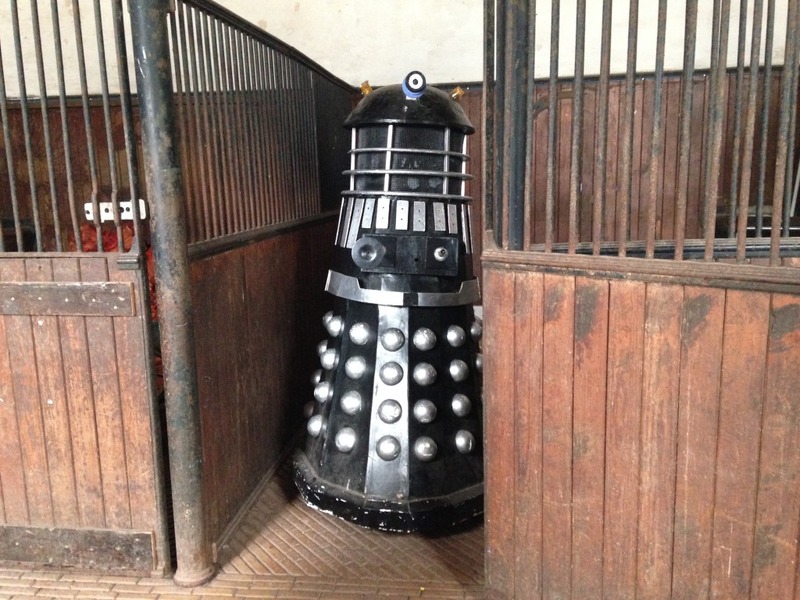 This isn't quite as random as it sounds - Doctor Who is often filmed at the house apparently. I have to say that the volunteers at Tredegar are among the best that I have encountered at the National Trust. They were extremely friendly and helpful, and quick to step in and explain things. The woman that told me about Evan Morgan must have talked about him 1000 times and yet she still sounded genuinely astounded by his shenanigans. Just when I thought that Tredegar couldn't get any better, I wandered into the enormous kitchens and found a woman in there making Welsh cakes. As she handed me one, she explained that the baking helped to create a nice aroma of food and it gave little kids a nice treat. Never mind the little kids, I thought, it's a nice treat for me - in fact, I wish every National Trust property served regional baked goods as a nice little treat in the kitchen. This was the 92nd stop on the National Trust Scone Odyssey, but only my second foray across the border into Wales. Back in January I had been to Aberdulais Tin Works and spent the entire journey worrying that I would ask for a scone and be chased back across the River Severn by pitch-fork-wielding Welsh people screaming "GET OUT, ENGLISH IMPERIALIST EVILDOER". So I was very, very pleasantly surprised to see scones at Tredegar today. And not only did they serve scones but they were EXCELLENT. My scone was one of the best that I have tasted. It was melt-in-the-mouth delicious. This means that I have now had an unprecedented SIX top-scoring scones on the bounce. Although this is a good thing, it brings it own problems; will people think I have lost my critical edge? In the immortal words of Chas n Dave, there ain't no pleasing the National Trust Scone Blogger. So I highly recommend Tredegar House - it's a very striking building, in beautiful grounds, with top class scones. Next week, this blog celebrates its second birthday (I know!) 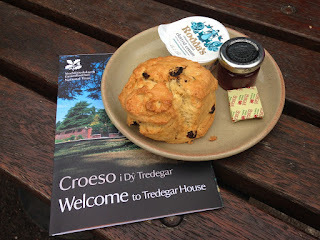 and I'll be sharing my list of the 32 properties that have served top class scones on the National Trust Scone Odyssey so far. Don't miss it!